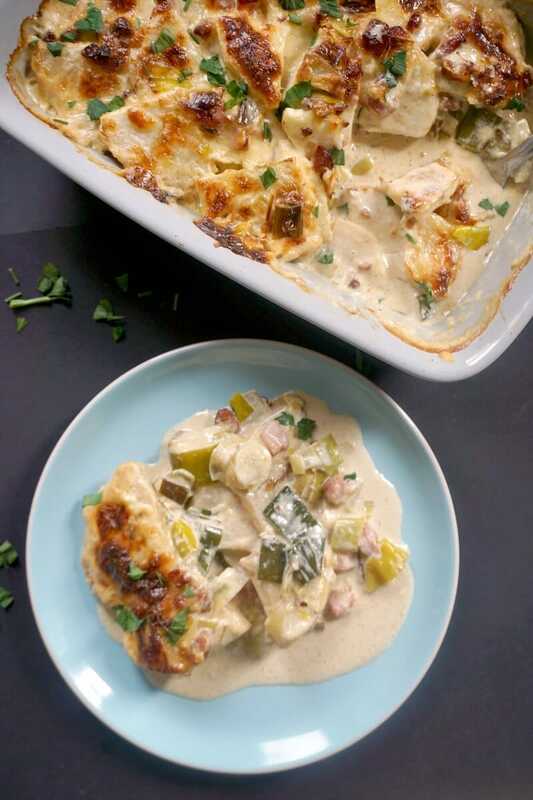 Creamy Celeriac Gratin with Bacon and Leeks, a delicious low-carb side dish that screams comfort food. It’s the perfect side for any roast, and makes a great choice for your Easter menu, or any other celebration. 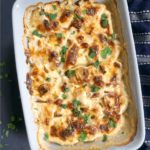 Whether you have embraced the low carb lifestyle or you just fancy something different from the good old potato gratin, this fantastic celeriac gratin will blow your mind off. It’s jam-packed with amazing flavours, it’s cheesy, and makes you lick your fingers clean with every spoonful. 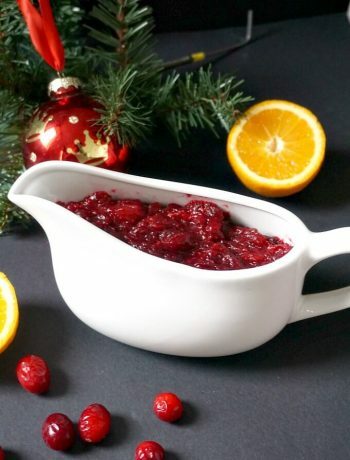 If you struggle to come up with low-carb variations of your favourite classic dishes when it comes to big celebrations like Easter, Thanksgiving or Christmas, this is the recipe for you. Celeriac is not something I cook with regularly. I do tend to go back to my favourite veggies over and over again, and forget other vegetables are around too. Well, that has to be rectified from now on. I absolutely fell in love with celeriac, and its subtle nutty flavour. 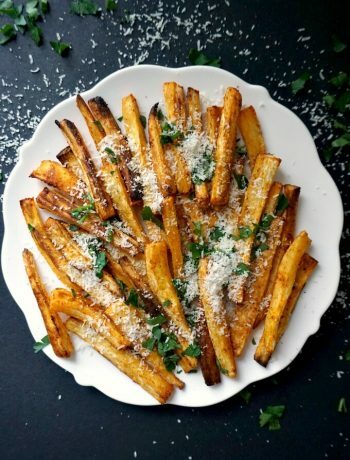 Unlike other root vegetables, it’s super low in carbs. How amazing, right? Pair it with leeks and smokey bacon, and you get a super yummy dish that will have everybody ask for seconds. How do you make celeriac gratin? This side dish is super easy to put together, but does take a bit of time to cook. Not that much prep is needed though, once it’s in the oven, you can forget about it for at least one hour. The baking time depends entirely on how thick the slices are, but even it they are on the thicker side, it should not take longer than 75 minutes to bake. Mine was ready in 60 minutes. There is no need to throw all that goodness away, the leeks will get a lovely smokey flavour. But, if there was not that much fat left from the bacon, add a bit of butter to soften the leeks. NOTE! It the top is browning too quickly, and the celeriac is not quite tender yet, cover the dish with kitchen foil and continue to bake it until tender. Can you make the celeriac gratin without cream? Absolutely! You can make the gratin with milk only, but in this case it has to be thicken with cornflour (corn starch). For this recipe I used 200 ml milk and 200 ml double cream (heavy cream). If you want to use milk only, increase the amount to 400 ml. 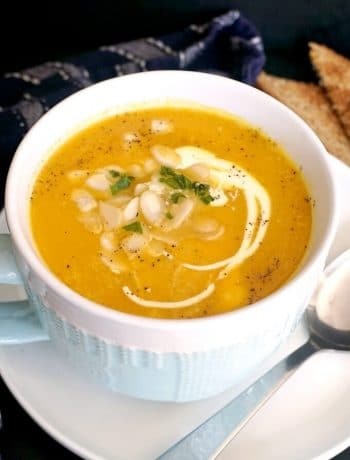 In a small bowl, add 2 tablespoons of corn flour and combine it with 2 tablespoons of cold water. Add the mixture to the milk, and leave to cook for 3-4 minutes until it thickens slightly. Then follow all the other steps. If you have leftover ham, you can use it instead of bacon. Another great variation is equal amounts of celeriac and potatoes cooked the same way. 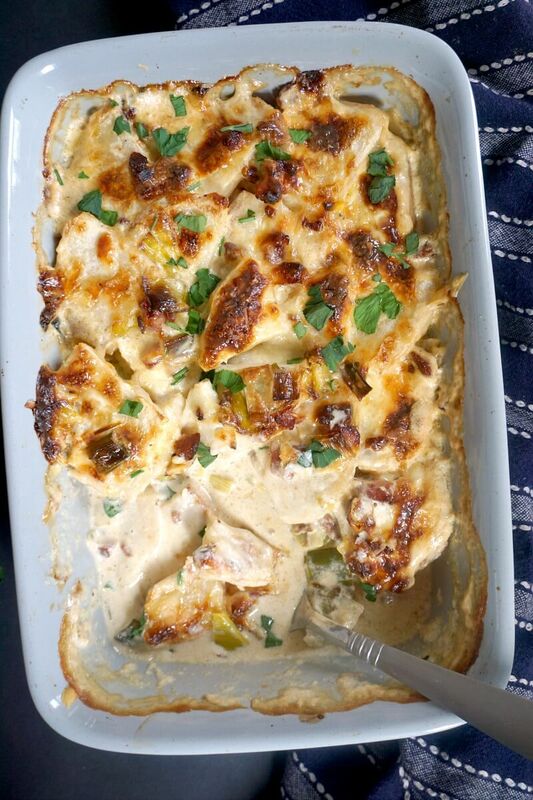 If you’ve tried this CELERIAC GRATIN WITH BACON AND LEEKS or any other recipe on the blog then don’t forget to rate the recipe and let me know how you got on in the comments below, I love hearing from you! You can also FOLLOW ME on FACEBOOK, and PINTEREST to see more delicious food and what I’m getting up to. 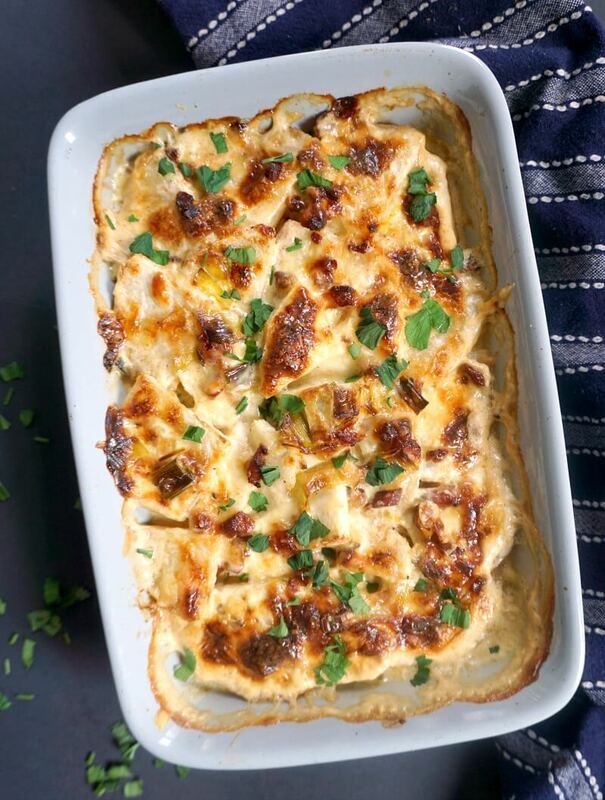 Creamy Celeriac Gratin with Bacon and Leeks, a delicious low-carb side dish that screams comfort food. It's the perfect side for any roast, and makes a great choice for your Easter menu, or any other celebration. In a pan, add the bacon lardons and cook for about 5 minutes or until crispy. Transfer the lardons to a plate and set aside. Wash and chop the leeks, and add them to the same pan, and sautee them in the bacon fat for 5-10 minutes or until tender. Add a bit of butter if there is not enough fat left from the bacon. Add the milk and half of the cream, bring to a boil, then remove from the heat. In a baking dish, add one third of the leek mixture, top with a third of the bacon, plus a third of the cheese. Peel and slice the celeriac, then arrange half of the slices on top. 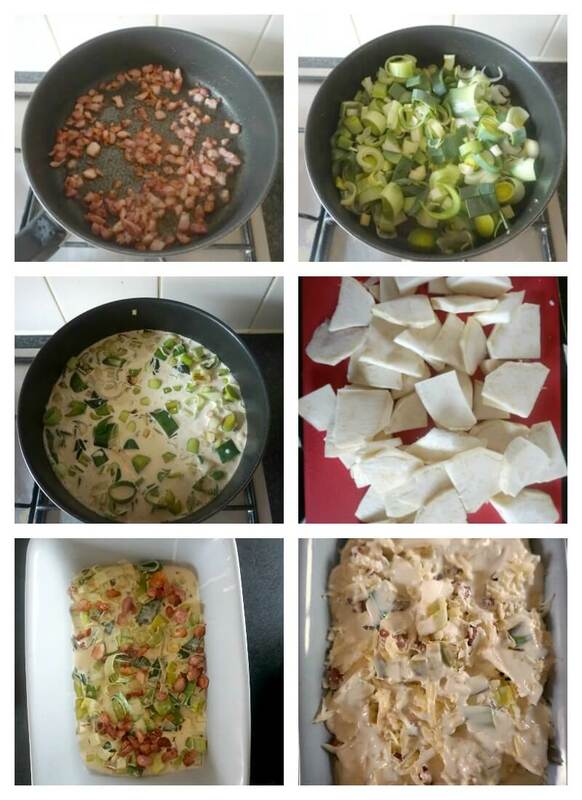 Repeat with more leeks, bacon, cheese and celeriac, then top with the remaining cheese and the cream. Bake for 60 minutes or until golden, and the celeriac is tender.